In this explanatory essay, a middle-school writer suggests four other faces that could be memorialized at Mount Rushmore and explains the contribution each person made. Four faces and 70 years ago, Mount Rushmore became part of South Dakota’s history. This monument honors George Washington, Thomas Jefferson, Theodore Roosevelt, and Abraham Lincoln, all great American presidents who have earned their place in history. But what if we decided to add four new faces to this monument? Whom should we select? My four choices are people who have contributed something special to others here and around the world. My first choice is Martin Luther King, Jr., who was a leader in the civil rights movement as well as a great speaker. His demands for a peaceful revolution for blacks in America resulted in his winning the 1964 Nobel Peace Prize. Unfortunately, he also became the target of racial violence, which resulted in his assassination at the young age of 39. Under his leadership, the civil rights movement gained wide support. In honor of his efforts, King became one of the few Americans whose birthday is observed as a holiday. The next choice is Helen Keller, who overcame severe physical handicaps and inspired many others with disabilities. When Keller was about two years old, she was stricken with a serious illness that left her deaf and blind. A teacher named Anne Sullivan moved in with Helen’s family and taught Keller to read and to communicate. During her lifetime, Keller became a very influential author and lecturer in this country and abroad. After World War II, she even visited wounded veterans in the United States and Europe, encouraging the handicapped soldiers to lead a full life. Albert Einstein is my final choice for the monument, even though he didn’t become a United States citizen until later in his life. Einstein was one of the greatest scientists of all time. When he was only 26, he expressed his theory of relativity: E = mc2. This theory is the basis for atomic energy, and it was said that only 12 people in the world could understand what the theory is all about. He also made several inventions possible, including sound motion pictures and television. In addition, Einstein showed great concern for oppressed people throughout the world. Famous presidents certainly deserve to be honored on Mount Rushmore, but so do people from other walks of life, including my four choices. Martin Luther King, Jr., fought for civil rights and equality, and Helen Keller helped disabled people lead better lives. Neil Armstrong led us to the moon, and Albert Einstein had one of the greatest scientific minds of all time. Who knows? Seventy years from now South Dakota’s famous historical monument may, indeed, have four new faces for people to enjoy and celebrate. 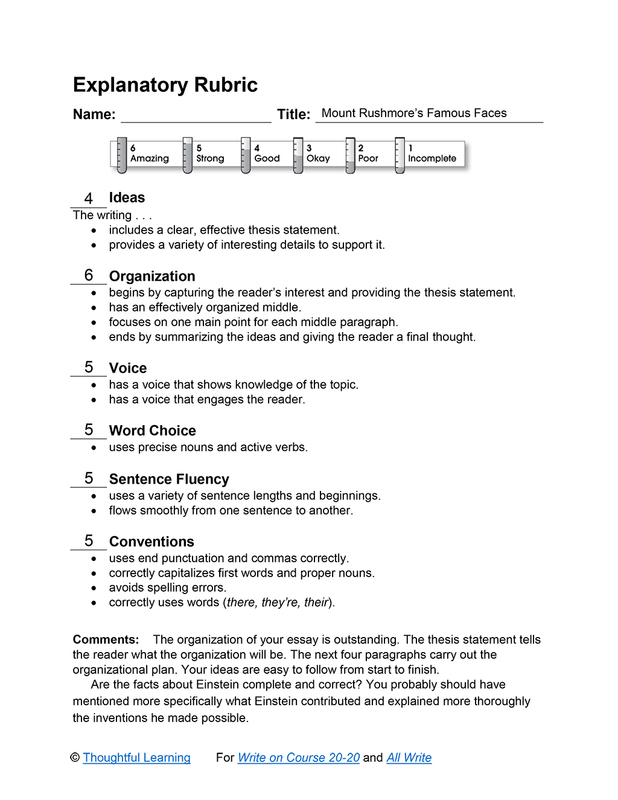 Mount Rushmore’s Famous Faces by Thoughtful Learning is licensed under a Creative Commons Attribution-NonCommercial-ShareAlike 4.0 International License. Based on a work at k12.thoughtfullearning.com/assessmentmodels/mount-rushmore%E2%80%99s-famous-faces.